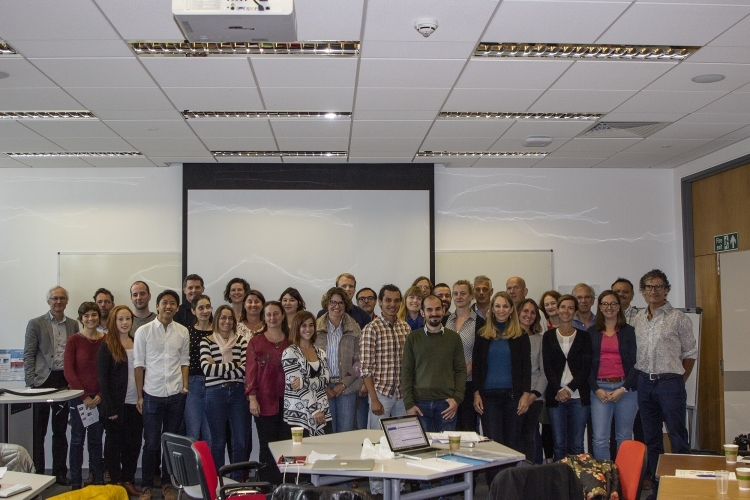 The identification of the genetic and non-genetic determinants of age-related macular degeneration (AMD) formed the centrepiece of the annual meeting of the EYE-RISK European project held in Belfast (Northern Ireland) on 13-14 September 2018. The meeting’s aim was to share the progress in the various studies conducted by the researchers over recent months. The researchers of the Barcelona Macula Foundation Research for Vision (BMF), in collaboration with the team of Queen’s University Belfast (Drs. Tunde Peto, Imre Lengyel and Jose Sousa), are aiming to discover whether there is a correlation between the phenotype and genotype of AMD patients. That is, to assess whether patients who present a particular aspect of the eye fundus (phenotype) have a particular genetic profile (genotype). It has been known for some time that AMD is associated with particular genetic alterations. However, it has been impossible so far to connect a specific genetic alteration to the presence of particular characteristics in the eye fundus (except in some rare genetic variants). The establishment of a genotype-phenotype correlation would enable patients to be classified better and would help to improve identification of the mechanisms by which the disease develops. Moreover, it would open the doors to creating personalised treatments in which two people with the same diagnosis (e.g. advanced dry AMD, also called geographic atrophy) but with a different genetic profile could receive different treatments in order to optimise the outcome. Another important aspect covered at the meeting was assessment of the possibility of forming a new consortium with the help of European funds in order to continue investigating this disease, which is the leading cause of blindness in developed countries. The inclusion of American researchers would expand the team. In addition, a topic of great interest that is not included in the current project is the influence of the microbiome (the set of microorganisms that live in our intestines) on the development and progression of AMD. These and other topics will be studied over the coming months.